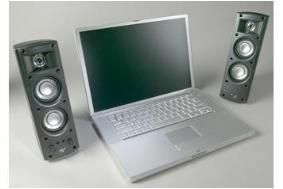 Klipsch ProMedia 2.0 speakers designed for multimedia portables | What Hi-Fi? The ProMedia 2.0 consists of two magnetically-shielded satellite speakers, each equipped with a 15W amplifier. Each satellite is a two-way design that uses dual 2.5in fibre-composite cone drivers and a 1in metallised polymer tweeter. A Klipsch MicroTractrix Horn is coupled to the tweeter for improved clarity, while the woofers are long-throw units powered by neodymium motor structures. One of the satellites – the control speaker – includes a volume and bass level control, a headphone jack and auxiliary input. The Klipsch ProMedia 2.0 is available now for £119 from the Klipsch website, Amazon and other leading retailers.